My grandmother came to America as a refugee from Nazi Germany at age 13. As one might imagine she as well as my great grandparents and my grandfather, who was also a German Jewish refugee, had no love loss for Germany, but still there were some foods from their youth that they enjoyed from time to time. Though I wouldn’t say I grew up with an abundance of German food, we did dine on it from time to time and I enjoyed it except for that dark, almost black, rye bread that’s so ubiquitous in Northern Europe. Everyone in my family loves that dark rye which is dense and coarse and has almost a moist quality to it, but I’ve just never developed a taste for it. Even after living in Denmark, where their black bread is considered so flavorful that Oprah herself fell so in love with it after a visit and had several loaves shipped to her back home, I still didn’t become a fan. When I found this recipe for Rūpjmaizes Kārtojums, Latvian rye bread trifle I was intrigued then when it turned out that I would be up to “L” just when my grandmother, who I adore, was coming for a visit I knew it was meant to be! My grandmother adores all of her grandkids, but I’m her only girl so we have a special relationship (and by special I mean I’m the clear favorite ;)). My grandma cooked because she had to and not because she wanted to. She and my grandfather raised 2 kids in a one bedroom apartment on a delivery man’s salary so she wasn’t exactly filled with a desire or the ability to get creative in the kitchen. Nonetheless she was a pretty good cook, but she is endlessly fascinated and proud at my love and ability in the kitchen so cooking for her is always a pleasure. 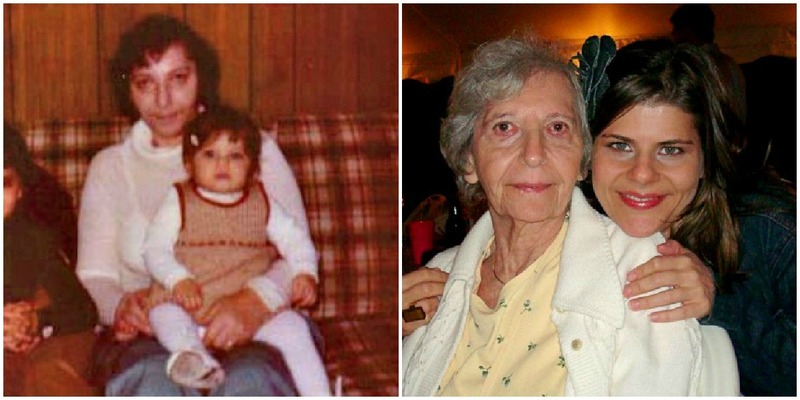 Me and Grandma, then and now. This is very much a “to taste recipe,” and, since my family doesn’t like very sweet things, I went light on sugar and didn’t sweeten the cream at all. In my research I learned that the dessert was traditionally made with ligonberries or cranberries, but is now commonly made with whatever you have on hand. Since raspberries are plentiful at the farmers market that’s what I went with. If you make this yourself you can sweeten the cream to your taste and use whatever fruit preserves you like. 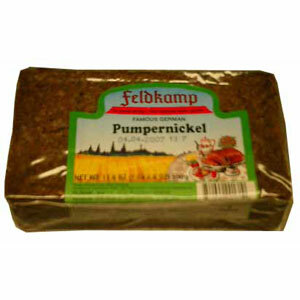 Make sure to use the darkest German rye bread you can find or use German pumpernickel as I did. Place a metal bowl and the beaters from your handheld mixer in the freezer until very cold. In medium skillet over medium high heat melt butter then add the bread crumbs, sugar and cinnamon; stirring to coat and cook until toasted, 3-5 minutes being careful not to burn the crumbs. Let cool to at least room temperature and set aside. Meanwhile make the whipped cream. Take your bowl and beaters from the freezer and pour your cream in. Beat to medium peaks. Add the vanilla and beat to stiff peaks. 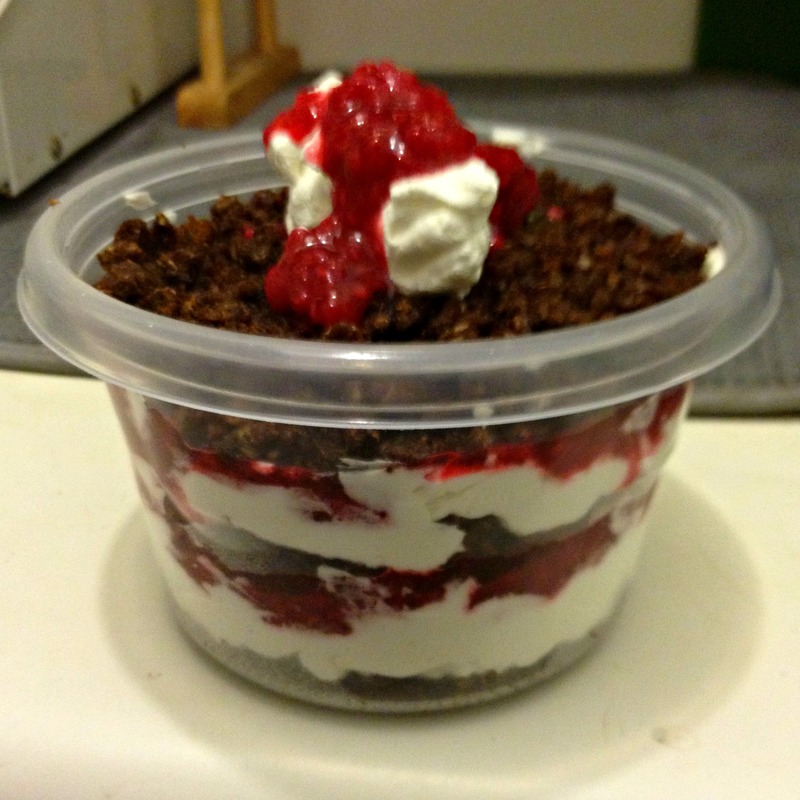 In a glass bowl, trifle dish or individual glasses or ramekins place a layer of rye crumbs, then a whipped cream and finally a layer of raspberry jam. Repeat until ending with a layer of crumbs, dollop of whipped cream and drizzle of jam. Combine all ingredients in a small sauce pan and smash the raspberries a bit with a spoon. Bring to a boil over medium high heat then reduce heat to low and simmer for 15 minutes. This will be fairly tart so add less lemon and more sugar if you want it sweeter. That’s right kids, my first A+ was made with an ingredient I usually hate. So in case you haven’t guessed yet, I loved this dish. I am so much more of a savory eater than a dessert eater, as is my whole family, so I’m shocked that my first A+ is for a dessert, but this recipe was perfect. I will definitely make this again and will not change one thing! Yes, I’m so ghetto that I put this in tupperware. Don’t judge! This entry was posted in Uncategorized and tagged Dessert, Latvia. I love those pictures of you and your grandma! And I did not realize she was a refugee from Nazi Germany… wow…. I am glad you had a recipe that turned out superbly – and garnered compliments from others! !